At long last, the original trilogy is complete. 2014 Topps Return of the Jedi 3D Widevision finally rounds out the original batch of films in the enhanced over-sized format. But there’s a bit of a twist. Rather than a traditional pack structure like Star Wars and The Empire Strikes Back received, this is a premium factory set. Not only that, it’s an online exclusive to Topps.com. Each factory set includes a full base set and at least two premium inserts. The first is a sketch card. The second is either a Sketch Card Relic or a manufactured patch card. Every fourth set includes an autograph as a bonus hit. The 2014 Topps Return of the Jedi 3D Widevision base set has 44 cards. They’re done in a tall boy format that’s larger than traditional cards. 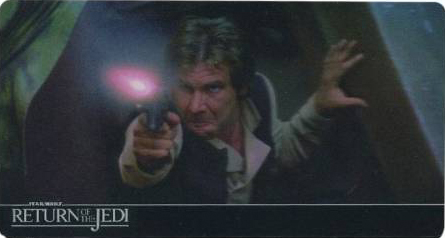 Base cards recap the final film in the original trilogy. Sketch cards are also done with the same oversized dimensions. 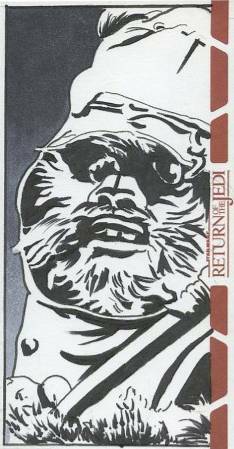 The same style was done with 2010 Topps The Empire Strikes Back 3D. Very few Star Wars relic cards have been produced. In fact, 2013 Topps Star Wars Jedi Legacy was the first set to have them in packs. Here, they’re given the added spin of being embedded into sketch cards. 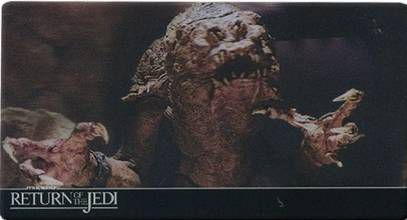 Pieces of Jabba’s sail barge and Ewok fur used in the film’s production are used in these cards. 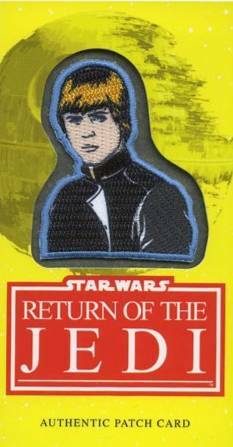 Manufactured patch cards are done to mimic the original 1983 Topps Return of the Jedi wrappers. Like the classic set, there are four different. The patches are of the characters shown on the wrapper. If you land an autograph, think of it as something extra. The set has ten different cards including Mark Hamill (Luke Skywalker) and Carrie Fisher (Princess Leia). 44 cards. Shop for base sets on eBay. 10 cards. Inserted 1:4 sets as a bonus hit. 4 cards. Either one patch card or one Sketch Card Relic per set. Topps has not released an official list of participating artists. 5 cards. Each card has a piece of material used to make the film as well as an original sketch. Either one Sketch Card Relic or Manufactured Patch card per set. 2017 Topps Star Wars 40th Anniversary Factory Sealed 8 Box HOBBY CASE-16 HITS!